A Licensed Tour Guide. A Different Side of Israel. Construction in Israel is always a difficult endeavor. In a country with as long a history as ours is, every time a spade or backhoe touches earth, there is the chance (or even the likelihood) that you will come across finds of archaeological significance. And when you do, construction grinds to a halt until the archaeologists can come in and examine the finds, determining whether they are significant, and whether construction can even continue there at all. 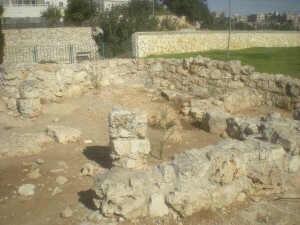 In recent years, building expansions have uncovered an ancient church at the site of a modern prison and an ancient cemetery near a hospital. In both cases, the building plans were halted until solutions could be found. Sometimes the archaeological site will be preserved at the location so people can see the finds in situ — where they were found, and construction will be abandoned. Other times, they will be covered and preserved underground, with the construction proceeding above the site. And sometimes the material will simply be removed and catalogued for later research. I’ve recently visited a few of these types of sites, all within the boundaries of modern Jerusalem. It is yet another reason why I love living here. I am constantly surprised by the history and archaeology that you practically trip over every time you walk around this magnificent city. Categories Select Category Culinary Israel Israeli Tourism Miscellaneous Mystery Photo Primers Product Review Today in Israeli History Tour Diary Tour Guide Course Uncategorized What Is…? All You Want to Know About Machane Yehuda – Part 7: What’s In the Shuk? With thousands of years of history, and tens of historical eras and ruling cultures, a trip to Israel can be confusing for those not versed in the history. It helps a lot to have a general overview before you visit. Even if you don't remember any of it, at least the terms will be vaguely familiar. I wrote a primer for just that purpose. Click here to read A Short History of the Land of Israel. In addition to the different cultures you'll encounter, there are also many unfamiliar terms you may come across in a trip to Israel. I've written a series of blog posts filling in some details about those unique things. These are about the terms that you might hear a lot here, but might never hear anywhere else. Click here to see a list of "What Is...?" posts.